An excellent documentary from the National Inflation Association . . .
Another Reason to Disband EDGE . . . The Mohawk Valley's greatest creator of jobs is now a member of the Mohawk Valley's job-creation agency. Oneida Nation Representative Raymond Halbritter has been elected to the board of Mohawk Valley EDGE. While critics of the Nation questioned the choice, others said it makes sense to put Halbritter's expertise to work for the greater good of the region. I am not a critic of the Oneida Indian Nation. The Nation has done a lot of good for the region, and I wish them well in their continued success. Unlike the OD, I am not wringing my hands over OIN's using its economic influence over others, because that is simply normal human behavior. HOWEVER, I am a critic of the way Our Government handles its relations with the OIN. . . and this appointment only makes things worse because it makes OIN part of our problem with EDGE. "Who controls EDGE? " was a question I asked back in 2005. It's reasonable to expect that whoever controls EDGE's money can exercise influence over EDGE's actions. . . . The real issue is whether Oneida County's industrial development policymaking authority has been usurped by a group of private individuals who are, essentially, acting in their own interests. It is one thing to tap the "expertise" among our region's corporate elite. It is quite another to give the elite governmental authority over business competition. Just like the textile mill owners used their influence almost a century ago to keep Ford and other manufacturers out of the region so they could avoid paying higher wages to their employees, our new EDGE elite can use their influence over taxpayer-funded efforts to ensure their own interests are protected and promoted. Those small local businesses who see OIN enterprises as unfair competition will only perceive this appointment as unnecessarily giving OIN even more of an advantage. This appointment is only the latest reason to disband EDGE. May 27th -- 90 degrees -- and it's a Snow Day! At least that is the case for several of our local school districts. Snow Day tomorrow, too. So if the streets seem quieter than normal, it's because the kids are not in class. . . and neither are the teachers even though they are being paid as though they are working. Snow Days were practically unheard of when most area people lived mainly in Utica. Even outside the city, you walked to school. The school year was more like 190 days give or take. Then, when Snow Days were first instituted as busing became the norm, they were like sick days. You take sick leave only when you are sick, not when you want a long weekend in Vegas. The 180 day minimum class days have become a joke as it is with all the distractions and interruptions -- such as the Ride for Missing Children. (Sorry, but there is no reason why the "Ride" cannot be done on a weekend). Now 180 days is more like a maximum. And students are now celebrating a 5 day weekend -- just what they need before exam time. This scheme must stop. Snow days should be used like sick days -- only when needed -- for snow. They should not ripen into extra vacation when not used. The kids could use the extra work and the teachers are already being paid for it. Students and taxpayers alike are cheated by late May "Snow Days." 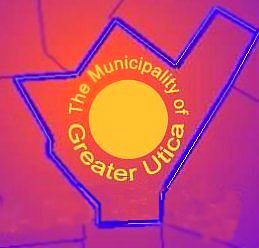 Is Now the Time for a Municipality of Greater Utica? When the topic of conversation turns to regional economic development, invariably EDGE's focus on Rome comes up. While EDGE bills itself as “your one-stop shop for economic development needs and business assistance in Oneida and Herkimer Counties,” a view of EDGE's website reveals a decidedly Rome-centric emphasis. Even though it is heavily subsidized by (and owes its existence to) Oneida County, why does EDGE have its offices in Rome rather than the county seat in Utica? Why does its website show nothing regarding the county's industrial park at the old County Airport in Whitestown? Why does EDGE have no programs targeting redevelopment of brownfields or small abandoned parcels and industrial sites in Utica and nearby villages like New York Mills or Oriskany? The closure of the old Oneida County Airport (UCA) was a blow to the Utica area because it caused a loss of jobs at the airport and in the surrounding industrial park; it made the industrial park less marketable; and it made the improved access from the new Route 840 less purposeful. In spite of the old airport being fully equipped to handle the air-related needs of the entire region, somehow the County deemed it appropriate to duplicate what was already at the old airport and to move operations to the much larger facility in Rome. Now county taxes, the bulk of which come from the Utica area, are used to support a facility that not only is far larger than the region needs but one that has actually removed jobs from the Utica area. Since the old airport served everyone's needs, why was it necessary to inflict harm on Whitestown? New Hartford and Utica residents (comprising more than one third of the County's population) pay charges on their phone bills for the Oneida County 911 system but receive no service in return. Now that these jurisdictions are considering dissolving their separate 911 systems to save money and letting the county system take over, county officials intend to impose a special fee only on New Hartford and Utica residents to continue the service. Why was it OK for these residents to have subsidized the county's service for years, but now that they need the county's services themselves, they will have to pay charges that are not levied upon other county residents receiving the same services? In the mid-1990s, a water authority was created (with county involvement) to take over the Utica area's water system. A few years later, the authority proposed to extend the water supply to Verona even though other sources were known to be more readily available. That raised concern over whether there would be enough water for the Utica area's future needs – all the more concerning now that a court has ruled that the water supply will be limited to the amount of water used back in 1970. Why are the needs of the Utica area – which holds more than half of the county's population and pays most of the county's bills -- overlooked or handled incompetently while the Rome area seems to get so much attention? Perhaps it is because, unlike Rome which is geographically large enough to include most of its suburban areas, there is no clear voice or policy-making body that can advance all of Greater Utica's interests. When it contained most of the area's population, the City of Utica was Greater Utica's voice and policy maker. With the advent of the automobile, that population spread out into more than a dozen jurisdictions. The City now speaks for only about half of Greater Utica's residents. Although all these communities view themselves as separate places, they economically depend on each other. For example, no one can seriously dispute that New Hartford could not have become the retail hub of the county but for the population base of Utica and its other suburbs next door to draw upon. The communities of Greater Utica also share a common infrastructure. Their residents drink the same water and their waste winds up in the same river. Perhaps Greater Utica's failure to move forward is the result of it being AN ECONOMIC ENTITY BUT NOT A POLITICAL ENTITY. What should be a common public policy-making body is dissected horizontally among 12 municipalities. In addition, the "regionalized" services of water and sewer, which make "growth" possible, have been delegated to two county-affiliated agencies with narrow responsibilities. This means that public policy for the economic entity of Greater Utica is split among 14 policy-making bodies! In the past this fragmentation resulted in the City of Utica being "selfish" with its water and sewer resources -- because Utica leaders knew that, if Utica extended water and sewer services into suburban areas, Utica would be subsidizing erosion of its own tax base. In the present, now that water and sewer have been removed from Utica's control (but still paid for by Utica residents), the fragmentation has become obvious. Policies are made that encourage situations like the creation of more sites for offices on green fields in New Hartford, while such sites are being abandoned in Utica and the villages. Reuse of brown fields and the existing infrastructure is ignored. Greater Utica residents either lose a suburban quality of life (if they live in New Hartford) or have to travel farther for goods and services (if they live in Utica), but all bear the burden of higher taxes to maintain an ever-expanding infrastructure. The Part-County Sewer District best illustrates how fragmented government and county-level regional solutions work against Greater Utica's interests. While the county treatment works and interceptor lines are governed by the Board of Legislators, the sewers feeding into that system are governed by city, town, or village councils. Recently, a county official complained that grease from New Hartford restaurants was getting into the county's system. There would have been no complaint if the county felt able to rectify the situation, but unless the grease also caused problems with New Hartford's sewer, there would be no incentive for the town to take action. Imagine this type of problem replicated in each municipality within the sewer district. Enforcement of sewer regulations becomes overly complicated and costly. During the 1990s county officials allowed new town sewer lines to connect to the county's system, increasing the load of pollution spilling into the river at the Sauquoit Creek Pump Station. Since most legislators represent areas upstream of the pollution, would the situation even come to their attention? In spite of the pollution load, the county had an incentive to permit more connections: development and an increase in the county's tax base. Now that action has been taken against the county through the Consent Order, fragmented local government presents an obstacle to the county implementing a solution. The sewers that need repair belong to several municipalities, not the county. Repairs to some village systems could drive them into bankruptcy. The county cannot just shut them down. On the recommendation of an advisory committee, the county is now seeking permission from each affected municipality to impose a uniform sewer user fee. The problem here is how to apportion the monies collected to ensure that residents of one community do not wind up paying to fix sewers owned by another. The county is still trying to figure this out because it has asked for approval of the fee without providing an enforceable written agreement detailing how the fees will be accounted for, spent, and how long they will be collected. If a solution is not implemented, the county will incur fines, but do not look to the county legislature to solve the problem. The county's fines will merely be passed on to all Greater Utica residents through their sewer fees. What will the future bring for Greater Utica? If past practices are continued, the county or a county-affiliated authority will be relied upon to provide “regional” solutions to Greater Utica problems as they arise. Policing may be the next service to be regionalized. Expect more of the same incoherent results. We need to admit that our fragmented system of local government has outlived its usefulness. We need to spend less time concocting poorly thought-out solutions to Greater Utica issues that do no more than preserve the status quo. Time would be better spent figuring out how we can merge a dozen jurisdictions and several districts and authorities into a new local government that gives the economic entity of Greater Utica a political presence. While the people of Greater Utica would benefit from this new local government, the county will as well. Responsibility for location-specific services such as the sewers, water, libraries, zoos, theaters, and industrial development, for example, could be devolved to the new government. This would free the county to concentrate on social services and its traditional role of providing a governmental presence in undeveloped areas. The benefits to the county make it appropriate for the county to kick-off the process. The county should create a volunteer citizens commission with access to planning department personnel. The commission should be charged with engaging the public in developing the blueprint for constructing the new municipality. Is now the time for a Municipality of Greater Utica? I think it is. Seeing The Light . . .
Two amazing editorials appear in today's Observer-Dispatch. A study by the Cornell University Program on Applied Demographics ... predicts the population decline across Upstate New York, particularly the Mohawk Valley, will continue for many years to come. . .
we have too much duplication of government. And as the population dips, there are fewer people to pay for it. That takes its toll on everything from property taxes to infrastructure, and that hurts the city more than the suburbs it spawned. But if we choose to abandon the city rather than invest in it, it will eventually destroy us all..
... new development outside upstate cities and villages continues, seemingly unabated by the population patterns and economic realities, as too many local leaders and citizens try to solve development-caused problems through more development. This upstate type of sprawl is not your father or grandfather’s sprawl – it’s not just an aesthetic blight of generic strip malls, cookie-cutter tract home developments, big-box stores, enormous parking lots and roads so wide with turning lanes that few dare to cross. It is far worse. Today’s upstate sprawl extends considerably further away from town and city centers; consists of larger homes built on larger lots (many of which demand more in services that they create in tax revenue); demands extension of increasingly costly municipal services to far-flung communities; and requires more infrastructure that is more difficult and expensive to build, operate and maintain. The associated cost and tax burden is borne by a shrinking and aging pool of taxpayers. There is simply no reasonable expectation in most of Upstate New York that population, home values or tax revenues can cover the costs of future decline and expansion of infrastructure. This conversation should have started 30 years ago when we regionalized the sewer system. . . or 15 years ago when we regionalized the water system. . . . but better late than never. Regional issues were taken care of by spinning off new governmental entities . . . or by kicking them up to the County level where there were competing demands. This resulted in more government with higher taxes or fees for all; myopic government that could only see its narrow mission (like the water authority or sewer district) without regard to the broader implications of what it was doing; incompetent government (water authority and sewer district) violating the law or old agreements, and committing us to expensive fixes or lawsuits; and the residents of denser older and poorer communities (Utica and the villages) paying the freight to supply services to less densely populated surrounding towns. The old way has not worked for a long time. Yes, let the conversation begin on how we can do this . . . how we can have one government for Greater Utica . . . while preserving what we love about our many individual communities. Cuomo Announces . . . The suspense is over . . . Andrew Cuomo has announced his candidacy for governor. After Spitzer/Paterson many people are breathing a sigh of relief . . . and with the totally lackluster candidates the Republicans are offering, Mr. Cuomo actually looks good. But before singing "Happy Days Are Here Again," let's remember an old saying: The apple does not fall far from the tree. Mr. Cuomo's father, Mario Cuomo, was a total disaster for Upstate, New York. The first Cuomo killed off a 99% built nuke plant on Long Island . . . and later sent Upstate power via the Marcy South Power line to Downstate to ameliorate the resulting high electric rates there . . . because we were part of the "Family of New York." Of course, it raised OUR rates making us unable to compete with other states. When US Senator DP Moynahan got the Feds to pay NYS for the Thruway in the late 80s, did the tolls ever come off? Again, Upstate was placed at a disadvantage to its competition. And who was governor when the deal with the Oneida Nation was brokered that allowed them to open a casino without the state getting a cut of the take - - unlike virtually every other Indian casino in the country? Not fair to visit the sins of the father onto the son??? Then consider . . .
Who headed HUD when all the subprime mortages were created -- the ones that led to our financial collapse? No, we do not need another Cuomo. Unfortunately, the Republicans don't seem to be giving us a better choice. NOT a Political Endorsement . . . Candidate for Assembly Greg Johnson says Assemblywoman Destito’s fiscal irresponsibility contributed in part to the plan to close 55 parks including Oriskany Battlefield. Greg Johnson, candidate for the 116th Assembly District, today said Assemblywoman RoAnn Destito’s (D- Rome) role in Albany's dysfunction is to blame for the governor’s plan to close dozens of state parks including the Oriskany Battlefield, and has also led to the inability to pass a state budget. “This is a perfect example of her having all the authority but accepting none of the responsibility,” said Johnson. The Paterson Administration is closing 41 state parks and 14 historic sites in an attempt to cut New York's spending and has ultimately led to the inability of the state legislature to pass the 2010-11 New York State budget -- which is now 48 days late. Johnson noted that as a long-time member of the Assembly Democrat Majority, Destito should allegedly have influence with her fellow Democrats to make more meaningful cuts in spending in order to save the parks, but instead has done nothing to keep the parks open, end the gridlock and pass a responsible budget. “This is Albany politics as usual and it’s robbing families of their quality of life,” said Johnson, who also noted that New York is facing bankruptcy because of years of overspending and overtaxing by Destito. “Our park system is a jewel and one of the few areas of state spending enjoyed by all New Yorkers from all walks of life. It’s inexcusable that families are being forced to suffer because the politicians in Albany won’t sit down and talk to each other to pass a fiscally responsible budget. Let’s not close our parks and destroy our natural legacy that so many New Yorkers have fought so hard to preserve,” said Johnson. “Our parks are more than just an affordable place for families to spend a few hours; they are a promise to future generations that they too will inherit our rich, natural heritage. It should never have come to this and it would not have if RoAnn Destito was more responsible with our tax dollars,” concluded Johnson. I can't say that I disagree with Mr. Johnson's assessment of the State Park situation. . . But what does Mr. Johnson propose to cut to solve the State's budget crisis? It is easy to criticize but politically risky to offer solutions. State spending has been intractable for years. Government has taken such a large piece of the economy that there is little left for anyone else. Only in wealthy Downstate areas is there enough money left over to support a growing private economy (which is probably why Downstate still increases in population while Upstate shrinks). New York State needs risk takers at this point. The alternative is more of the same, with eventual financial collapse. Love the one you're with . . .
Mr. Johnson has yet to demonstrate that he offers an alternative. . . that he will have the nerve to propose spending cuts and do other unpopular things a leader will have to do to save New York State and save our area. Mr. Johnson, give us reasons to vote for you other than you are not the other guy. It IS Fair . . . The Utica metropolitan area finished 195 out of 200 sites. Look at the bright side: At least Utica is still being ranked . . . for now. “I don’t believe that it’s right or fair for a magazine … to include a community like Utica in some sort of list based on hypothetical, arbitrary figures they’ve collected,” Utica Community Revitalization Director Robert Sullivan said. Of course, it IS fair. Everyone considering a move to someplace new will judge their move using criteria that are somewhat subjectively chosen or are subjective in and of themselves. That's life. There is no reason to believe that Forbes has an axe to grind with the Utica-Rome Metro Area (the population quoted makes clear that it is Oneida and Herkimer Counties including Utica, Rome, New Hartford, Whitestown, southern Herkimer villages, etc combined that are being ranked). Utica-Rome is being judged by the same criteria as every place else that is ranked. Unfortunately, we are practically at the bottom. Sullivan said many of the region’s issues in attracting businesses are statewide — a view shared by Mohawk Valley EDGE President Steven DiMeo. Agreed, agreed, agreed, agreed and agreed. But . . .
(1) What have local officials done to control those things that are within their ability to control? (2) What have local officials done to get the state to change those policies that place us at a competitive disadvantage? I have yet to hear local officials talk seriously of merger of Utica, its suburbs, and all Utica-centric authorities and services. These entities are inextricably bound to each other by infrastructure, geographic proximity, and a common marketplace. . . but they all move in their own directions with one adversely affecting the other. They are also so small that none can afford competent direction. It is bad government . . . and it is expensive, redundant government. No one wants to give up their turf. . As a result, outsiders don't come here because they don't want to be bothered with the cost, incompetence, and multiple fiefdoms. (The same can be said for the Rome area and for the southern Herkimer County villages). As far as the State is concerned, where are the coalitions of Upstate representatives in the Assembly or Senate? And where are the other local officials? Not a peep out of them, e.g., when the tolls were continued on the Thruway long after the road was paid off. Not a peep when tolls have been increased on multiple occasions. Not a peep when tolls were shifted to maintain I-84 downstate, which is a free expressway. It seems we Upstaters are plagued with representative that place their own interests above their constituents. While Upstate may not have the votes, reason, when marshaled and clear, can be a powerful persuader. . . but there is no reason. Here is the Report on Utica from Forbes. This is only the latest wake-up call of many. It's time to stop hitting the "snooze" button . . . Plunging Populations: New Forecast --- Or Old Reality? The problem: OUR GOVERNMENTS (State & Local). The solution: US GETTING GOVERNMENT OUT OF OUR WAY. The starting place: Get rid of the politicians in charge who are clueless as to the cause-and-effect of what they've been doing for the last 40 years. May Phoenix Now Available . . .
After a couple months off, I'm back writing for the Utica Phoenix. This month I look for the Utica Master Plan . . . not the one under development now . . . nor the 1960 nor 1950 plans . . . but the ORIGINAL master plan. It's there . . . if you look hard enough. . . . and that vision from the past might be just what we need today. Read "Uncovering Utica's Original Master Plan" in the Phoenix, now available. Also check out the great coverage of the Montecassino exhibit and City Hall ceremony at which several local veterans were honored . . . Good things are happening in Utica that many don't know about! Getting around the law . . .
“I think the chairman of the Liquor Authority basically said what I’ve been saying for thee years — this is a creative way to accomplish what we’ve all been talking about,” Oneida County Executive Anthony Picente said. The 'record of compliance' of someone seeking a government license often comes up when administrative agencies decide to issue or not issue the license. The intent of that is to protect the public from those who have a track record of not complying with laws. Here the State Legislature has mandated that the Oneidas pay taxes, but they have not ... nor do they comply with other State laws based on their sovereignty. Yet the State has issued a license that will benefit the Oneidas in spite of their non-compliance with State Law. It does so on the pretext that the license is going to a Third Party -- which party just happens to have a familial connection with a local legislator. The issue for me is neither the taxes (it's just more money to waste), nor the Oneidas. It is the State's tolerating an entity that thumbs its nose at State laws, while giving that entity a benefit under those laws based on connections or pressures. If someone is big enough, or powerful enough, or has the right connections, state and local government will work in a "creative way" to get that person around government-created restrictions -- to get that person what they want -- to give that person a competitive advantage over others. Is it any wonder why people have no respect for government anymore? Is it any wonder why people (who are not on the government take) do not come to New York to set up shop any more? Is it any wonder why people and businesses are leaving New York? Cwik Comments . . .
. . . Let's see who turns this into a political football first. The Swancott Home is obviously more valuable as an historical site with, rather than without, its fixtures. The fixtures and antiques should not be auctioned off. The "It's private property" argument does not generate sympathy here. Rescue Mission, while legally a private entity, drinks at the public trough through donations and government grants. Historic preservation holds a significantly broader public appeal than the narrow (but noble) mission of the Rescue Mission. To harm the former simply to generate cash for the latter will, without doubt, undercut support for the Mission in the future.